Hi everyone! I wanted to share with you my homemade spaghetti sauce recipe that I have canned this week, and it is so GOOD! You know, there is no store bought sauce that will even come close to the flavor of this homemade sauce. But to get that flavor, you must use tomatoes that you’ve grown yourself or purchased from a farmer’s market or a pick your own field. I always can my spaghetti sauce, but you could just make up a batch of fresh sauce and take advantage of homegrown tomatoes that are so readily available right now. And you could easily freeze the sauce instead of canning it. But I always can mine because once you make your initial investment in your equipment and jars then it is very economical to do so. But what makes it even more economical for us is that we have about 75-80 tomato plants! And you can betcha that I’m going to preserve those tomatoes! Our tomato plants have been especially productive for us this year with each bush giving us at least 20 or so tomatoes. The steady rain along with the dead fish and crushed eggshells that we added to each hole have certainly paid off in a bountiful crop. You can read more about that in the post called Our Tomato Planting Tips. We have sooooooo many tomatoes right now. These are just a few that we picked yesterday and they just keep coming. So I’ve been doing a lot of canning this week, but I’m going to stop long enough to give you my spaghetti sauce recipe. 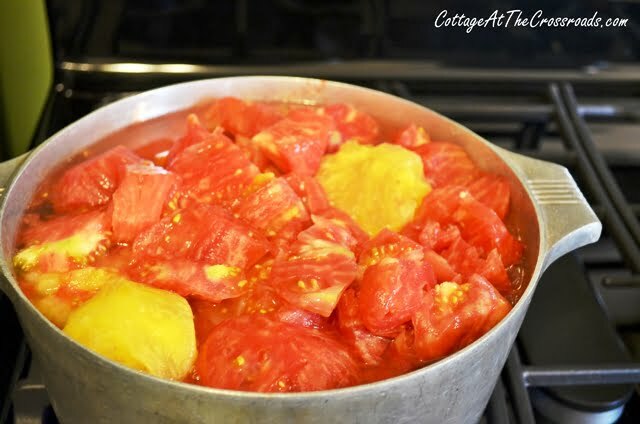 You will need about 25 pounds of fresh tomatoes, and the first thing you will need to do is to get the skins off those babies! 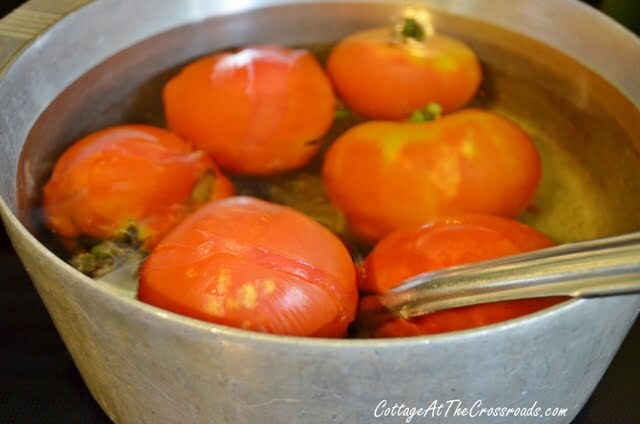 Wash your tomatoes and dip them into a pot of boiling water for about 1 minute. Don’t leave them in any longer because you don’t want to cook your tomatoes, you just want their skins to split. Immediately plunge them into ice cold water. You can see that the skin will slip off easily. 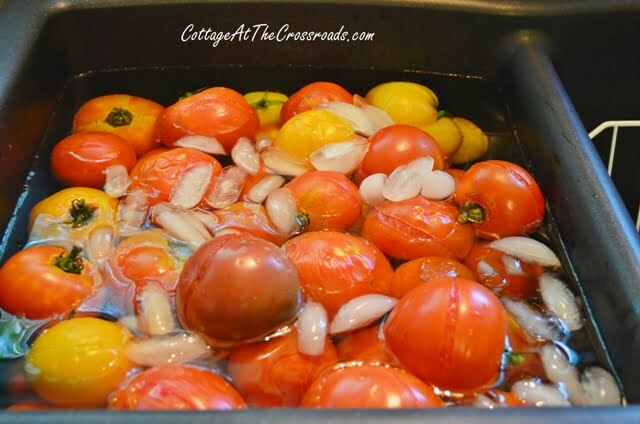 Before you know it, you will have a sink full of split-skinned tomatoes! The next step is to remove the skins and the core. If the tomatoes are large, cut them into quarters. By the way, the yellow tomatoes are called Lemon Boys. Although they look like lemons, they are really sweet tasting tomatoes! Bring the tomatoes to boil over medium high heat. 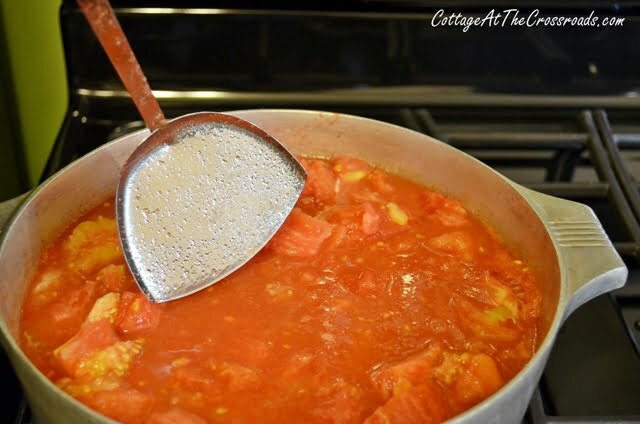 Be sure to keep stirring the tomatoes because you do not want them to burn on the bottom! To quickly break down the tomatoes, I use a flat metal spatula to chop them as they are cooking. Turn down the heat and allow the tomatoes to cook for 20 minutes or so but remember to keep stirring! 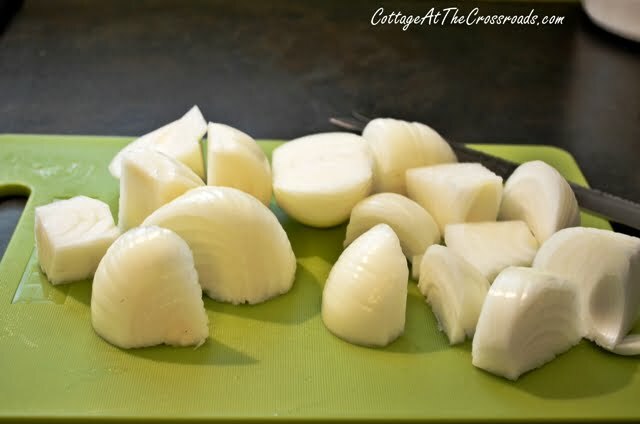 Meanwhile, peel and cut 4 onions into quarters. I put mine in the food processor, but if you don’t have one, finely chop them. Add the chopped onions to the sauce and stir. I’ve found that a long-handled wooden spoon is very useful for all this stirring! 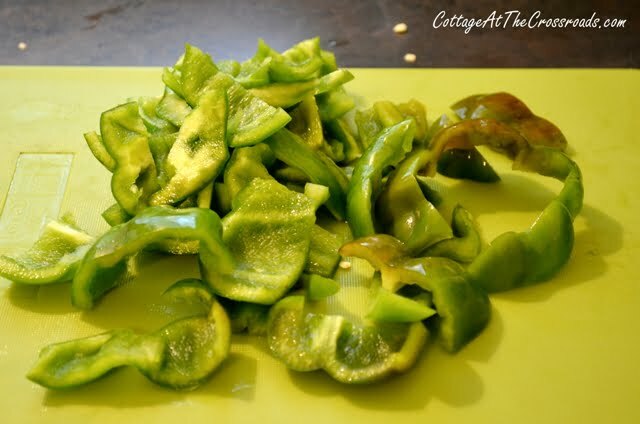 Wash four green peppers. Here you see 5, but mine came out of the garden and they were on the small side. I cut my peppers into chunks and then threw them in the food processor. Add the chopped peppers to the sauce and stir some more! Now we like our spaghetti sauce nice and garlicky, so I use a whole head of garlic. But you may want to adjust the amount of garlic to your taste. 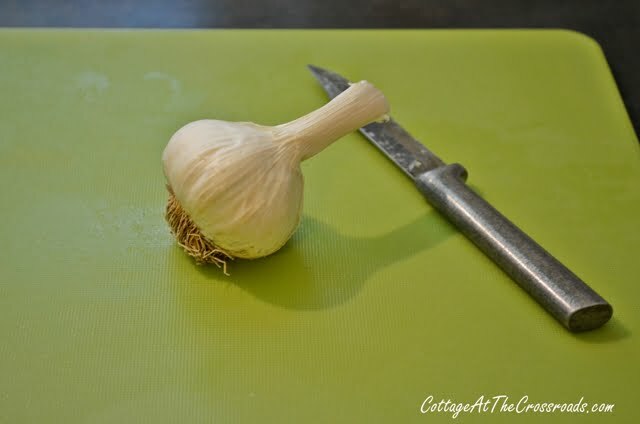 Finely mince the garlic and add it to the sauce. Don’t forget to stir! To thicken the sauce, I add 2 cans ( 12 ounce size) of tomato paste. You could omit this step, but you’d have to let your sauce cook for a few hours to reduce the amount of water in the tomatoes. Besides, I think the paste gives the sauce a richer taste. Let the sauce simmer for about 30 minutes while stirring constantly. Then add your spices. I use 2 tablespoons dried oregano, 1 tablespoon dried thyme, 1 tablespoon dried rosemary, and 2 tablespoons dried basil. Now this is a real secret ingredient: 2 tablespoons Worcestershire sauce! Gives it a real depth of flavor! Simmer the sauce for an additional 10 minutes while you get out all of your canning gear. Sterilize 8 quart sized jars in hot water and place new lids in a pan of simmering water. Screw bands need to be washed but not warm.To be on the safe side, add 2 tablespoons of bottled lemon juice to each jar to raise the acidity of the sauce. Using a wide mouth funnel, add the sauce to each jar, wipe the rim of each jar with a clean, damp towel and add the lids. Screw the bands on with your fingertips. Meanwhile, fill a water bath canner half full of water. Lower the jars into the canner and bring the water to a boil. Process the jars for 40 minutes, beginning the timing when the water starts to boil. At the end of the 40 minutes, remove the jars from the canner using a jar lifter and place them on a clean, kitchen towel on the counter. Allow them to cool for 12-24 hour. Check to make sure each jar has sealed properly. In the middle of the winter, you’ll still be able to taste the summer flavor of fresh tomatoes in your canned homemade spaghetti sauce! I’ve been canning for 35 years and it never occured to me to add “store bought” tomato paste to thicken my sauce. Light bulb moment! My sauce had always tasted overcooked by the time it was as thick as I wanted it. 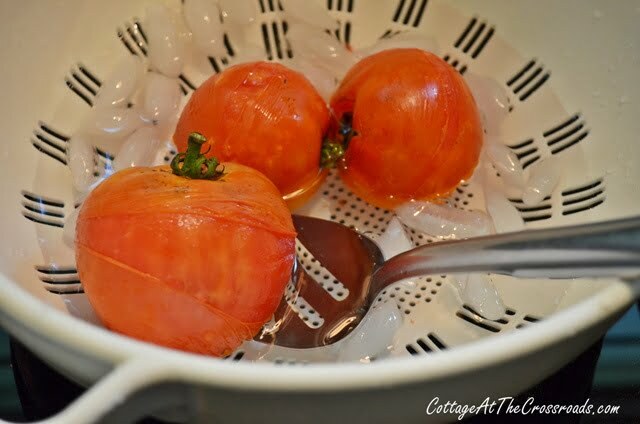 I run my tomatoes through my Victorio food strainer to remove seeds and skin. 25 lbs. = about 3 gallons of puree. I don’t like to add lemon juice so I pressure can it 25 minutes at 11 lbs. pressure. This is my third year using your recipe and we love it! 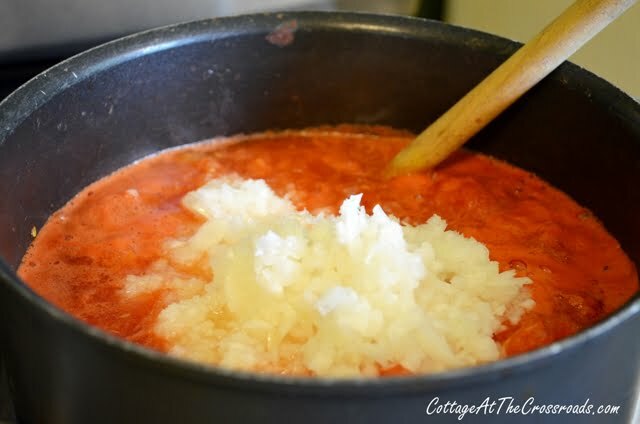 Here’s a tip for the commenters who say their sauce is too acid, when you are heating your sauce to serve add a pinch of baking soda and stir it in, it will foam up a little, taste, you can add about 1/4 tsp. to a quart of sauce and not change the taste, but it will cut the acidity. Thanks for sharing your recipe, I’m canning a batch of it today! I’m so glad you have enjoyed the sauce recipe, Vickie! And thank you for coming back to give us that tip about adding the baking soda! I am new to canning. I purchased a box of canning tomatoes from a local farmer. I made some salsa first, so ended up a little short on tomatoes (good thing as my pot barely held what I had, Ha!) I ended up adding all spice quantities as written, except basil as I ran out of dry and had to use fresh not knowing how mush fresh to use) with the addition of dry mustard and marjoram just because I felt like it. I only needed 1 can of paste, yet ended up with the same quantity, I believe 6 3/4 quarts. I used a stick blender to purée some of the sauce, it was plenty chunky to do so and still be chunky. I ended up using a lot more of the spices it calls for, but that’s just me or maybe my spices were old. To me, if a recipe is good, but needs more or less of the spices called for, it’s a good recipe as ‘to taste’ is very subjective. I give this 100 stars! At the risk of sounding like a bragger, my sauce was amazing!!! I ordered another box and am making more tomorrow!!! Thank you! And happy canning everyone! So delighted that you loved the sauce! I have a bunch of #10 cans of tomato sauce and want to can spaghetti sauce with it. How can I use it and use a water bath? You could use your tomato sauce, but the point of this recipe is to preserve fresh tomatoes. Would roma tomatoes work as well with this recipe? Yes, Roma tomatoes would work perfectly as they are traditionally used in making tomato sauce. Because they are smaller, you may not get as many jars of sauce as I did! Be sure to put the lemon juice in the bottom of each jar if you are adding peppers and onions as I did to keep the acidity level safe. I am new at this. I would love to try this recipe, but my question is: do you refrigerate them or put them in a pantry or cabinet? Traci, once you have processed the jars using the water bath method, you can keep the jars in the pantry or a cabinet for up to a year. If you didn’t want to do that, you could always make a batch and freeze it. If you freeze the sauce, you don’t need to add the lemon juice. About how long is the shelf life on these jars? A good rule of thumb is to use all canned goods within a year. Hello, I want to make your recipe as I’ve had it pinned but I’m still new to cooking and as of today you have 204 comments so forgive me if this question has already been asked but can I put this sauce in portions to freeze instead of canning? I haven’t worked up the nerve to can yet, again forgive me because I know this is a big part of your post but I would like to make it! Any help would be greatly appreciated. Thank you for sharing your recipe. Oh yes, you could definitely freeze the sauce. If you freeze it, you don’t need to add the lemon juice. Made this recipe today, but I totally forgot to add the lemon juice. What should I do? Is it absolutely needed? Yes, the lemon juice raises the acidity to a safe level. It’s crucial to add it or a similar acid. Use your jars of sauce quickly. you never really say how long you cook your sauce wirh tomato paste. Simmer the sauce for 30 minutes, then add the spices and Worcestershire sauce. Then simmer an additional 10 minutes. I’ve pureed my tomateoes- about how many cups will I need? Beth, I really cannot answer your question since I don’t puree my tomatoes. Go ahead and proceed with the recipe and use your judgement about how many onions and peppers to add so that you don’t have too many veggies in there. And don’t forget to add the lemon juice to each jar to raise the acidity. I made a batch of this sauce 2 weeks ago and it is AMAZING!! I will be making another batch tomorrow because it is so good. I love how fresh and tasty it turned out. Depending on time and tomatoe availability, I may make a third batch next weekend. I know what I will be enjoying all winter (especially with homemade pasta)Thank you for such a great recipe!! Thank you so much for coming back and leaving your feedback about the spaghetti sauce. Enjoy! Do I need to add boiling time for high altitude? We’re going to the farms tomorrow for tomatoes. I’m excited to try this recipe. Thanks for the info. Can I cut this recipe in half if I don’t have that many tomatoes? Sure, you can halve this recipe! I would still add the full amount of lemon juice to your jars, though, for safety’s sake. When you get ready to use your canned sauce, you can always add a spoonful or two of sugar to reduce the acidity. I’m sorry, Phyllis. I cannot tell you how much citric acid you can substitute for the lemon juice, but I do know that you can. I made your recipe for spaghetti sauce and it burnt some on the bottom of the pan. Is the sauce ruined? Have you tasted it? If it just burned on the bottom and you didn’t stir it, you may be able to save it. My husband wants me to add mushrooms to the spaghetti sauce when I can it. How long should I pressure can quarts for if I add mushrooms? Thank you! Since you are using a pressure canner, it will be fine to add mushrooms. But since I do not have one, I cannot advise you on the amount of time! So sorry! I wanted to try this recipe. Could we not put in the green peppers? Of course you can leave out the green peppers. add or subtract the spices, or other ingredients you do not like. Except for the lemon juice, if using a water-bath process. Hi! I made your recipe as-is. The sauce looked wonderful. I did a taste test before putting it into the jars, but the taste was very tart. Is it because it has no sugar in it? I went ahead and water-bath canned it anyway, putting the lemon juice into each jar first as you suggested. What did I do for it to be tart tasting? And what do I need to do to get it tasting normal? Thanks so much! Leigh, I purposefully do not add any additional sugar to the sauce when canning as it may change the acidity to an unsafe level. When I get ready to use the sauce, I taste it and then add a bit of sugar and other seasonings. Come back after you use the sauce and let me know if you like it. Is it safe to waterbath can with fresh chopped garlic and dried herbs (or fresh)? I thought they required pressure canning. 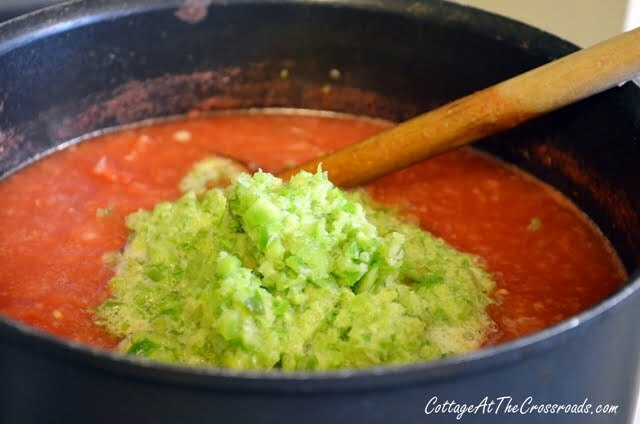 a dumb question, but how is or the amount of tomatoes already put through food processor equal to 25 lbs of tomatoes want to try this receipe. I wasn’t able to taste any lemon flavor. I made pint size jars using a little less than 1 Tbl. of lemon per jar. Hello… I made this recipe today and has a bit left over. I thought it was missing something so I let my hubby try it and we both decided there is no salt in this recipe… Did you accidentally omit it? Tomatoes need salt so I added a pinch to what I has left over and it tasted like real spaghetti sauce. Please tell me what happened. I am very disappointed I spent all day and sealed my jars only to find an ingredient missing. ???? Mary, I never add salt to the sauce until I open the jars prior to using them. I do a taste test and add salt and any other seasonings at that time. I think the whole point in canning your own sauce is to avoid the excessive amount of salt and preservatives that you find in store bought sauce. Just add salt to you sauce when you get ready to use it. Is this recipe safe for me to use chopped zucchini and grated carrots instead of peppers? Thanks! I don’t put salt in anything, green beans etc., I can either. I salt it when I cook it too. I am 67 and have been canning all my life, with my Mom when I was young. Years ago one of my Mom’s friends told me she didn’t put sugar in any fruit either. Therefore, I don’t use sugar either until after I open my fruit. They lived through the Depression and couldn’t waste sugar. Jane, I used some of your recipes last year! Found them and this one on Pinterest. Thanks! You have used quart jars and I want to use pint jars. Would that cut down the water bath time? I think you can safely take 5 minutes off the processing time. Can I purreed the tomatoes after skinning and then cook down. I don’t like chunks of tomatoes. Can I add salt along with the lemon juice? If so, how much per Quart? Hi, Great recipe! Do you think I would have a problem putting red pepper flakes in the sauce. I like to add some spiciness to my sauces. I got 16 pints from the recipe the first 8 were as is the second half got a Tbsp of Red Pepper Flakes and it seems just right. A tablespoon of red pepper flakes in a quart jar of sauce?! Wow. I hope you like it extremely spicy! After some time in the jar, those pepper flakes are going to really bloom. I meant pint jar…but still seems excessive, if it were a quarter. Might put a tablespoon I a whole batch…and would probably still worry about it! If I freeze the sauce instead of canning, do I still need to raise the acidity levels? I never had time for this stuff before, so I’m new to all this stuff. If you’re freezing your sauce, you can omit the lemon juice. You only need to do that if you’re canning your sauce. What a great website you have! I’m going to try this recipe and do some canning. My question is this: along with full size heirloom tomatoes, I’ve also got a ton of SunGold cherry tomatoes… would these be okay to add, leaving the skin on? I made this as my first ever canned spaghetti sauce. What a hit! I purchased the tomatoes, 25 pounds for $9.99. I calculated the cost per jar (i made 14 quarts) to be $1.50 (I had the jars and lids already) I can’t wait to taste summer all winter long. Thanks for posting! Thanks for Sharing !! I gonna give it a try this coming summer. 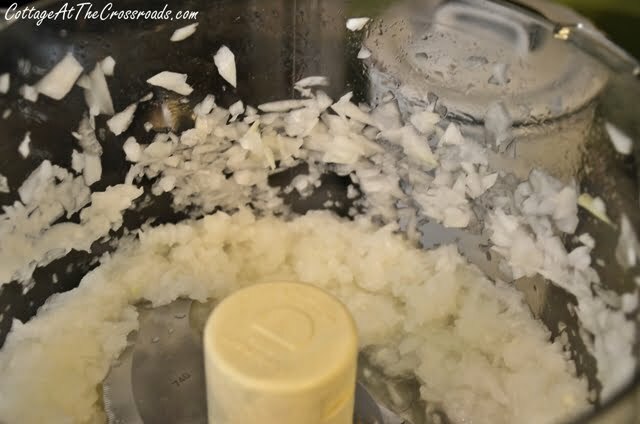 Oops, I read your reviews and got the answer to my question re: pressure cooking canning! Thanks again!! My hubby wants to go that route, but I will tell him about the water bath and adding extr acidity….yum! Hi Jane, we are like u, our tomatoes are really coming on! Is it okay to use a pressure cooker method instead of the canner water bath? You recipe looks wonderful and we want to try it…love your sweet pets !! We also have one dog and two cats! Great post. I am new to long term food storage. Did you refrigerate after canning? Or put it on the shelf? What can be put on the shelf and what has to be frozen? Going to try this recipe!!! Jane, do you have a glass cooktop? I can never seem to get my grandmother’s canner up to boiling on my glass cooktop? The canner has a big indentation in the bottom. Any tips? I freeze my tomatoes and the skin then comes right off. I also run through a food mill to take out the seeds. Nice! Thanks for sharing your tomato sauce recipe. Thank you for the step by step instructions. This is my first attempt at making any spaghetti so I only made half a batch. If it tastes as good as it looks I will be making quite a few batches. I have spaghetti sauce simmering on the stove now. 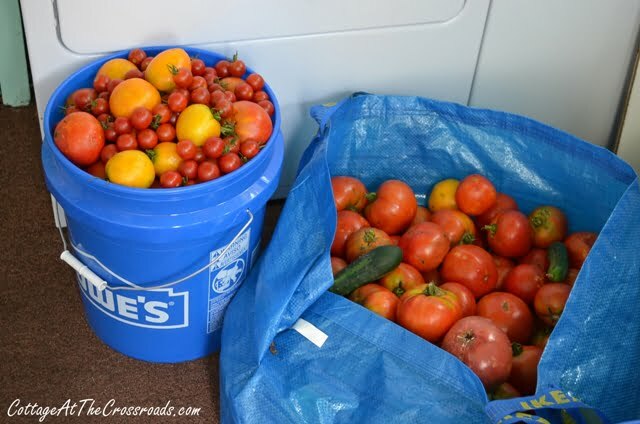 Looks like we will have a good crop of tomatoes–my husband carried in a 5-gallon bucket full of tomatoes this morning and it weighed over 30 pounds! Using that as an estimate, he has picked over 120 pounds of tomatoes with more to come. I am running low on canning jars and will freeze the spaghetti sauce. My plans are to cook another batch tomorrow. I asked my husband how much money he had spent on seeds and started plants for our entire garden and he estimated $35-40. So if you have the space and want to save money, start gardening! Thank you for sharing your recipe! I have 15 plants in my back yard and can’t wait I have plumb, heirloon, gold and yellow and of course red. I hope it will be a bumper crop this year! as I make sweet and hot chili sauce as well! This is just what I was looking for!!! Making it as I type (between stirring)!! one of my jars did not seal, can I eat this jar in the next few days if it is in the fridge? Alison, you can keep the jar in the fridge, but be sure to use the sauce within a few days. One way you can use it is in making eggplant Parmesan! I just made this yesterday afternoon. Everyone in the house raved that it was better than anything you could ever buy! 12 hours after the water bath one jar did not seal, can it be eaten in the next few days if I put it in the fridge? the tomato paste is 2-8 ounce cans or larger? You’re right about home canned sauce being much tastier than store bought sauce! I started canning last year with some friends and have been hooked ever since. If you can’t manage to grow enough of your own at home, pick your own farms are a great alternative (or supplement to what you can grow). I picked 40lbs of paste tomatoes just yesterday and paid only .75¢ a pound. Last year alone I processed about 100lbs and canned in pint in a half jars using the boiling water-bath method. This year I splurged and bought a 25 quart All American pressure canner and it is worth every penny. They are a bit on the pricey side but if you can with friends you could always share equipment. One thing I have to stress is the importance of ensuring safe acidity levels Even if you pressure can, you STILL need to add either lemon juice or citric acid. That is a really large pressure canner, and canning with friends would certainly speed up the whole process! I always add meat, mushrooms, and sugar to my sauce when I’m getting ready to use it. I don’t see where you are adding any type of acid or pressure canning the sauce. Isn’t this dangerous? Heather, you must add 2 tablespoons of lemon juice to each jar to raise the acidity. Otherwise, the sauce would need to be pressure canned. What if you use pint size instead of quart… is it still 2 tablespoons? or 1? I do pint jars and use 1 Tbsp of lemon juice and a leaf or two of fresh Basil in every jar. I made this the day after I found your recipe. …. first time canning or making spaghetti sauce. … it is delicious as well as rewarding. ! Rhonda, thanks for coming back to let me know. I have always found canning to be extremely rewarding, too. Thank you so much for a well organized and documented process. Very helpful. I was wondering if I could cool the sauce and place it in freezer bags and pop them into the freezer instead? I am sort of afraid of the bottling process. Of course you can freeze the sauce, Maj! I don’t freeze much because my freezer is not very large, but my sister-in-law freezes hers. Hi, I came across your recipe for spaghetti sauce when I was searching for one I can do in a water bath method. Most of the spaghetti sauce ones I have come across calls to be processed in a pressure cooker, I was wondering how long they stay good when you use the water bath method? I know that tomatoes are acidic and it depends on the acidity of what you’re canning what method you’re supposed to use and etc, so I guess my question is why can your sauce be used in the water bath method and others have to be pressure cookered? I want to use yours because of the water bath but I don’t want it going rancid or serve up a nice helping of botulism either. Nicolette, the only way you can use the water bath to can this recipe is by adding the lemon juice to each jar to raise the acidity to a safe level. That’s extremely important so don’t skip that step! Love the recipe, and I have the same steel paring knife, that belonged to my mother, and probably her mother before…….how can I possibly go wrong? Maureen, it was my mother-in-law who introduced me to those knives. They are the best! Hi – I’m a newbie canner and I am so excited to try this recipe! But I have a quick Q for you… can I use fresh herbs as I have all of the herbs you call for in this recipe. I actually don’t even buy dried herbs anymore (I simply dry them myself). Thanks so much and I look forward to enjoy this yummy sounding recipe!!! This sounds delicious, I’m looking forward to making it very soon!! Just a quick question though: Can you use fresh herbs & spices instead of dried? Yes, you can use fresh herbs but just remember to triple the amount called for in this recipe. Hope you enjoy the sauce! Wash tomatoes, scald in hot water to loosen the skins; plunge into ice water; remove any bad spots; put through a food mill using a piece of good quality cheese cloth in a strainer sitting over a pot to catch the pulp (while the juice drips into the pot); then scraping the pulp into another pot (adding back in some of the juice); seasoning with the herbs and veggies and simmering for a little bit; then processing both the sauce and the saved juice? I prefer to process in a pressure canner. It takes less time/energy, I don’t have to add lemon juice (or vinegar), and I know that everything is safe. Also, the tomatoes/juice/sauce seem to have a fresher taste rather than a “cooked” taste. I don’t like to waste things, and it seems to me that you can get more out of your efforts that way. p.s. I use San Marzano tomatoes because they have more “meat” and less liquid in them. I love them! How long did you process in a pressure canner? Monica, I don’t use a pressure canner. I use the water bath method. That is the reason that the lemon juice is needed for this recipe-to raise the acidity to a safe level. First time canner here – can I use pressure can this recipe instead of water bath? Just have to leave out lemon juice.. correct? Oh yes, you can use a pressure canner. And if you do, you can leave out the lemon juice. I’m new to canning. After canning home made past sauce, does it need to be refrigerated or is it safe in a cupboard? Do you do anything to ensure the acidity level in the sauce is high enough to prevent botulism? I made this, only a much smaller batch. It was a lot of hard work, but it turned out pretty good. I haven’t actually tasted it after being canned YET though. Can’t wait to taste it! Can I use freezer bags instead of canning? I know you are not suppose to mess with canning recipes, but I was wondering if you have substituted fresh herbs? I’ll be trying the recipe today. Thanks for posting it. It sounds really good. I tried to skim through the comments as my tomatoes are simmering. I couldn’t find where you said what size the tomato paste cans were? Thanks so much for sharing. Can u use a food processor to chop the tomatoes don’t like big chunks!? I’m sure you could put the peeled tomatoes in the food processor, Sara. More than likely it will reduce the volume but I’m not sure since I’ve never done that. If you do it, please come back to let us know your results. Just don’t forget to put the lemon juice in your jars to raise the acidity! Hi! I am new to canning, actually I’ve NEVER CANNED, I’m a virgin! I’ve been searching for days for recipes that look delicious and I just keep coming back to yours! Wish me luck. Thanks for the step-by-step instructions you’ve provided. I have to make a pit stop to the grocery store for a few items but all in all I have most ingredients. My hubby bought me all of the canning necessities for my birthday (3 months ago) So, I better get to it! I’ve read so my “ways of canning spaghetti sauce” my head is about ready to explode! But yours looks simple and yummy. Here’s to my first canning experience! well from making salsa, before I put them into the jars I taste it and if i think it needs more onions or peppers or herbs i just add till I get the taste I like. Did you taste it before you canned it? I am allergic to lemons of any kind can you suggest something different for someone who can’t use lemon as an extra for the acidity? Thank you for sharing. Tracy, you can substitute vinegar for the lemon juice. This was my first time making sauce. I have a two 1/2 yr old so I threw in some diced zuccini and grated carrots. Turned out beautiful. My husband and I have been blessed with a bumper crop of tomatoes along with many other goodies. At this very moment we are following each and every step to make your spaghetti sauce. Can’t wait to try this out. Thank you so much for the pictures and detailed instructions as well, much appreciated. Thanks so much for sharing this recipe with great pictures! After reading through several recipes I chose yours because it was easy to follow! I canned all day & my husband, a fireman, took a jar to work the next day. As most know, firemen are usually great cooks (because they have to cook during their 24 hr work days) & they’re tough food critics. The results: SUCCESS!!! After a school fire four very hungry firemen were very content. My husband loves Prego & thought this was very similar, but of course, much better. The only change I made was omitting the green peppers & using celery instead. 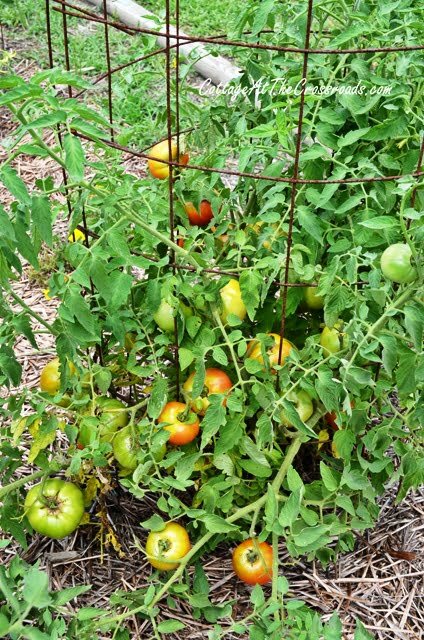 I have tons of tomatoes coming on in the garden… can’t wait to make more! Going FRESH and LOCAL is awesome!! For anyone you know who has Lyme Disease or might have! What size cans of tomato paste are you using in the recipe? Thank you for a healthy recipe without oil and sugar. I can’t wait to try it. Another question. Does it have to process that long? My great aunt makes tomato soup in quarts and on processes 15 minutes. Kristy, I always process the sauce for 40 minutes and I’ve never had an issue with spoilage. I’d rather err on the side of safety! Can you add fresh mushrooms to the sauce before you water bath your sauce? I would not add the mushrooms, Cheryl. Adding the onions and peppers already reduces the acidity of the tomatoes. That’s why you need to add the lemon juice to be safe. If you added the mushrooms, you would need to process the sauce using a pressure canner. Do you HAVE to peel the tomatoes? Samantha, I have always skinned the tomatoes so I’m not sure how this sauce would be if you didn’t. But in the comment above, a reader named Kristy did not peel hers. It turned out really tastey. And not many chunks for my young kiddos. We’ve used it for mini pizzas and spaghetti already. Thanks for letting us know how the sauce turns out if you leave the skins on, Kristy! Wow! I made this today and skipped peeling them. Used an immersion blender instead. It made 14 quarts! I guess maybe from the addition of the skins?? Kristy, I’m sure I lose a lot of the tomato by skinning and coring. The skins must really increase the volume. Sounds great, I’m going to make it tomorrow with all of my fresh tomatoes. As far as the question above about whether you can taste the lemon juice; you cannot omit the added acidity! Can. Not. If you’re only going to give the sauce a water bath it is imparative that you add enough acid for good preservation. If it was only tomatoes you might be able to get away with no lemon juice but when you add other ingredients you change the acid levels. Lemon juice or 5% acid vinegar is an absolute must for the safety of your sauce! Jackie, thanks for suggesting vinegar instead of lemon juice and I have amended my response to that person. I am certainly no expert on canning and we can all learn from one another. Thanks so much for sharing.. I’ve never canned before but I want to start.. Doesn’t sound nearly as difficult as I thought..
No, it’s not really hard Doug. Just read up on the safety tips before you begin and get all of your equipment ready. It’ s like anything else-the more you do it the more comfortable you get with it. I make spaghetti sauce every year for 30 plus years and ALWAYS use a pressure canner because of the low acid in the peppers and onions. You can buy a Ball canning book (my canning bible). Boiling only gets the temp. to 212 degrees and pressure canning gets it to 240. Just being safe. I am going to try this but will adapt it to can and keep the ph lever safer for my family and grandkids. I have indeed read the Ball Book of Home Preserving as well as several other books on the topic. But if using a pressure canner gives you peace of mind about the safety, then by all means use it. Am I right in guessing this recipe makes seven quarts of sauce? Danielle, you should be able to get at least 6-7 quarts of sauce from this recipe. It really depends on how many tomatoes you add. Good luck with your sauce making! Janel, I would think that this sauce would freeze beautifully. Can you use a pressure canner? Kareen, you most definitely can use a pressure canner. I cannot wait to get one because it speeds up the processing time and allows you to can more things safely. How much time in a pressure canner and at what pound pressure? Cheryl, I do not use a pressure canner to process my spaghetti sauce. I use a water bath canner so I cannot advise you about the time and pressure. If you are going to process your sauce in a pressure canner, you will not need to add the lemon juice. Canning is a great way to preserve food, but mixing low and high acid foods can cause problems with warm water bath canning. 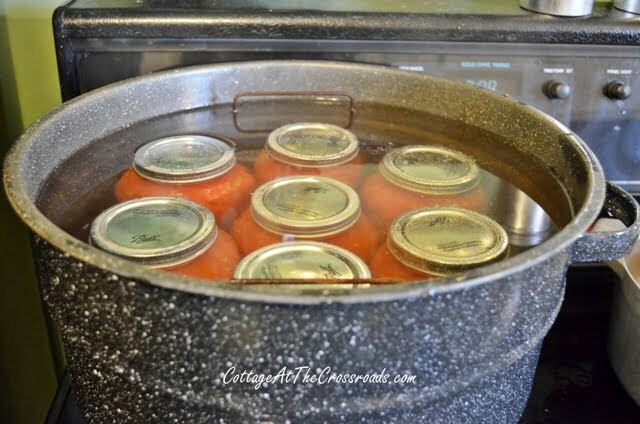 Even though you are using tomatoes and adding lemon juice (makes it more acidic), the moment you added peppers and/or onions, you changed the acid content of your food which required pressure canning. According to http://www.foodsafety.wsu.edu/consumers/factsheet4.htm, to ensure safety and reduce the chance of botulism, it would be safer to use pressure canning than warm water bath canning for this recipe. Lis, I’m sure that using a pressure canner would remove all chances of any botulism forming, but I have never had a problem with this recipe using the water bath method. Not to be a downer, but that seems like a lot of work and a LOT of tomatoes for only a few jars of sauce (that my fam would probably go through in a month–we use it for everything). I’ve boiled/skinned tomatoes before and it takes quite awhile. 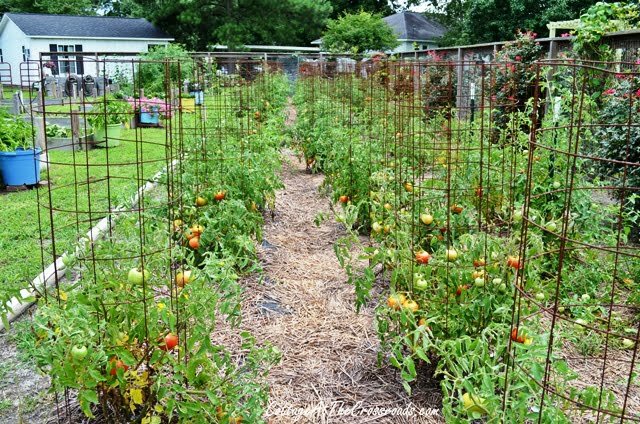 Plus, most people do not have that many tomato plants and even in season, tomatoes at the store tend to be pricey. Any tips on getting good deals on tomatoes? What’s the cheapest you could get 25lbs of tomatoes for to make doing it this way worth it cost wise? Thanks! And, your sauce does look delicious. Brit, the process of making your own sauce and then canning it is quite time consuming. But it’s also a better quality product because there are no preservatives or salt in it. Not to mention that it tastes so fresh when you open it later. Before we had a garden, I have gone to a pick-it-yourself tomato farm and gotten a better deal than what you’d pay at a farmer’s market. Even if you don’t want to can the sauce, you can make it to eat now and freeze the rest for later. Thanks so much for checking in advance, but you’re more than welcome to share it, Kara! Is this a really runny recipe or is it thick like store bought? JoEllen, the tomato paste makes the sauce fairly thick. If you’d like it even thicker, you can cook it uncovered for a while before you use it. Love your recipe! We are retired now & don’t have a huge garden anymore. I also don’t can anymore. I freeze sauce in freezer bags on a baking sheet. They stack so nicely! Would this recipe freeze well? I love how there are no preservatives. Thanks! I used your recipe for canned spaghetti sauce tonight. I made my husband taste it since he is the picky one in our household. Judging by his expression and the fact that he actually sighed after taking it, I am going to guess it was heavenly lol. 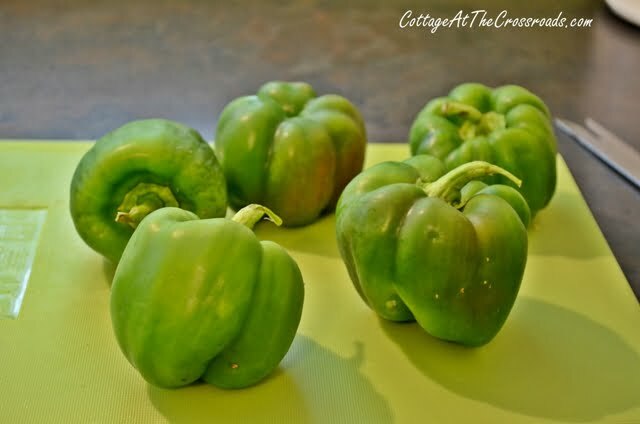 Thank you for posting your recipe, it has helped me, along with the few others I have tried, to begin canning foods for my family to start saving money on groceries. I appreciate it!!! How long will the jarred sauce last in the pantry? The canned sauce should last at least 2 years, perhaps more, Sarah. I found a few jars left from last year when I was cleaning out the pantry, so I’ll use those first. 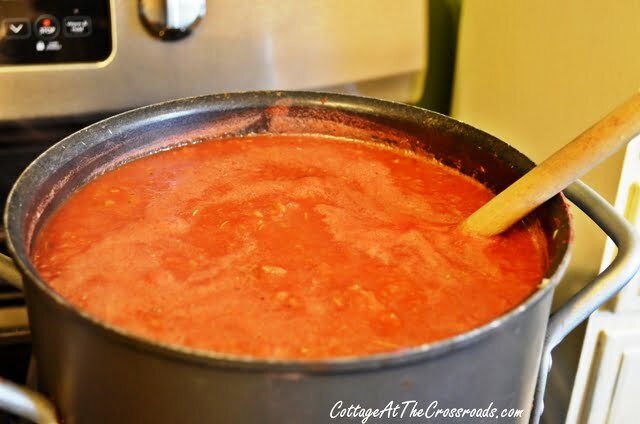 New to making homemade spaghetti sauce… how much sugar do you add when you are ready to use it? Amanda, I adjust all the seasonings when I get ready to use it. I usually start with 2 tablespoons of sugar to counteract the acidity and then I taste to see what else I need to add. We don’t like our sauce too sweet so it really is a matter of taste. Good luck with your spaghetti sauce making! 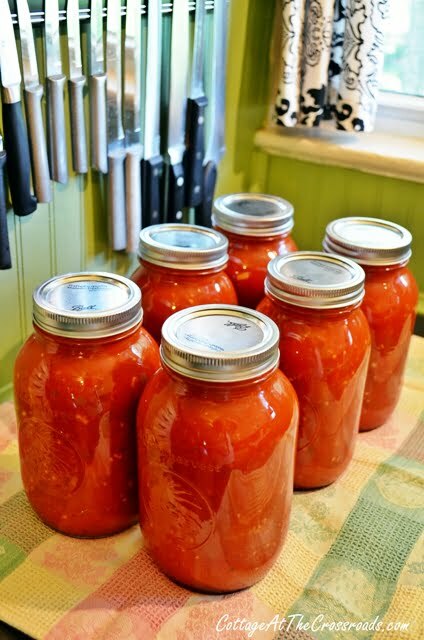 Good Morning Jane, I normally make up my tomato sauce as I need it, but I love this idea of bottling (canning) tomato sauce so that it is ready to use when I need it. I do not grow tomatoes in my garden, as I tried last year, but our weather here in the North of England was so awful, that the tomatoes were just the size of pennies, so I am going to visit my farmer’s market to buy lovely fresh tomatoes and try bottling my own sauce. Thank you for the detailed instructions, as I feel I can attempt bottling now. 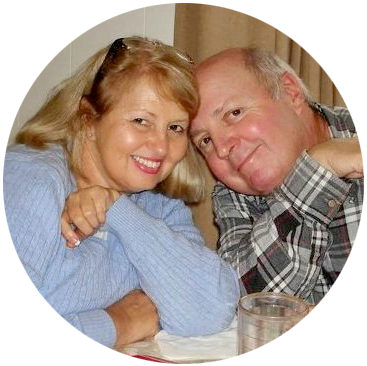 Jane I have really enjoyed my visit and so I have signed up to receive your blog posts by email. I looked to become a follower, but I could not find anywhere…. apart from Facebook. I would like to invite you to visit me at Ivy, Phyllis and Me! when you have a moment, as the door will always be open. I’m so glad you found our blog and thanks for becoming an email subscriber. I will definitely come visit you as well. Thank you so much for this recipe. We have just started getting our tomatoes in as well, and I’d definitely like to try doing this sauce instead of just canning all of them like I usually do. Thanks again! Wonderful recipe that I will be trying. Quick question, I have always brought my water to boil while I was cooking then put the bottles into the water and started timing as soon as it was boiling again. Do the bottles need to slowly come up to temp? and I live at 6,000 feet so I normally have to add 10 min, is this the same for this one? Angie, I’ve done it both ways so I don’t think it matters. I think the most important thing is to start timing as soon as the water comes to a boil. And yes, I would add 10 more minutes due to your higher elevation. I am almost at sea level! Thank you so much for posting this recipe. Can’t wait to get busy and use those tomatoes. Thanks Carla! Canning is hard work but it is so rewarding to open those jars during the winter time! How many quarts does this recipe make? Janice, this recipe should yield at least 6 to 7 quarts of spaghetti sauce depending on the number and size of tomatoes that you use. Honestly, I don’t count my tomatoes. I cut up enough to fill a large pot about 2/3 full of cutup tomatoes and then start cooking them down. Some thoughts on this sauce. I have been making homemade sauces for many years, and is this recipe designed to make 6 large jars of sauce? If so, the spices seem a little low for this size batch. Such as the Worcestershire sauce, only 2 Tbs? I plan to try it, however I am just wondering is there a mistype someplace. I only add 2 tablespoons of Worcestershire sauce and I tend to go easy on the spices, too. Dried spices tend to intensity the longer they are in the canned sauce. I don’t add any salt or sugar when I can the sauce. I wait until I’m ready to use the sauce and adjust the seasonings to our tastes. I’ve found that it’s much easier to add later than to add too much when canning! 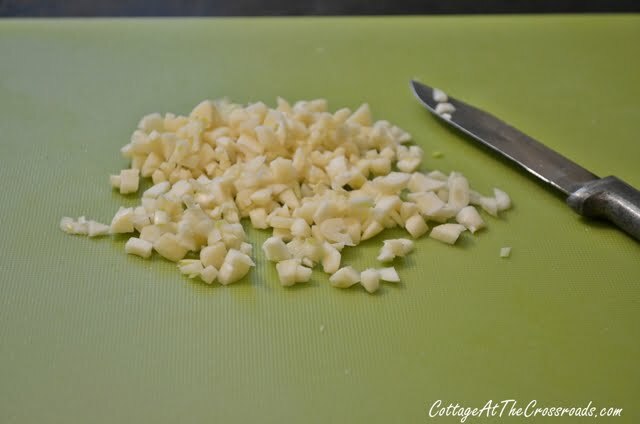 When I get ready to use the sauce, I do saute more onion, garlic, celery, and ground beef and add all that to the sauce. Hope you enjoy the spaghetti sauce! Lots of ‘maters! Your recipe sounds excellent and I really like the idea of canning sauce. Thanks. Maybe next summer I can do this. Hard to can with a broken leg! Wow, you have been busy! Tomatoes here have just started to ripen. I have never had sauce with peppers in it. Maybe be a regional thing? It all look good, and how you will enjoy those when the cold weather comes! I just shared your blog on my Joy 2 Journey FB page and of course this recipe! I pinned it too 🙂 It looks so yummy and I am excited to try it with my tomatoes this summer. 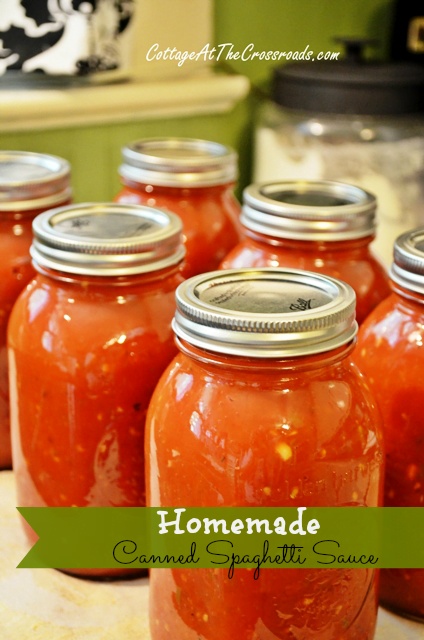 Homemade sauce is so much healthier too! Looks great! Yes, you’re right Carlene! There are no preservatives or extra salt in homemade sauce! Wow, look at all those gorgeous tomatoes! Your sauce looks amazing! Oh my …you have a ton of tomatoes ! Thanks for the recipe ! Thank you for sharing this with us. Can you taste the lemon juice in the final product once its done? I’ve added lemon to other things before, because the recipie asked for it, and even though it was a small amount, I could taste it. Debora, I can’t really detect the taste of the lemon juice in the sauce but that’s probably because I always add a little sugar to the sauce when I’m ready to use it. If you are sensitive to the taste of the lemon juice, you could substitute vinegar that has a 5% acidity level.You really want to be on the safe side by increasing the acidity. 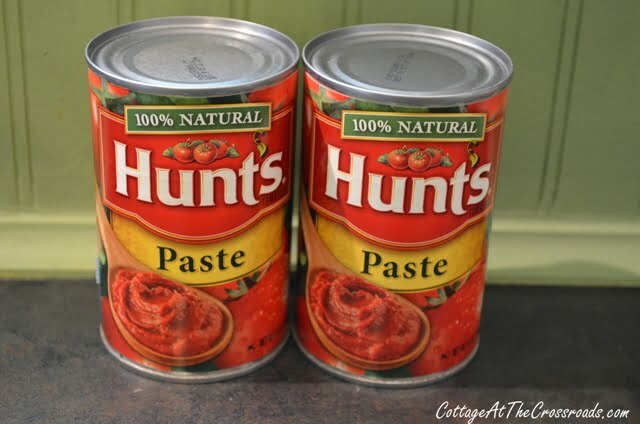 What size are the cans of paste you add?? Wow, Jane that is a lot of tomato plants and tomatoes. We have had way too much rain and our tomatoes were doing so good and then the plants started dying and the tomatoes are just falling off. I told hubby we need to add dead fish and egg shells next year. The reason, from what I understand, that they die like that is because they aren’t getting enough nutrients. I used the bucket system this year. You drill holes into the sides about three inches from the bottom and in the bottom of the bucket/small trash can and bury it about 2 to 3 inches in the dirt. Then you fill that with compost. Plant four tomato plants around it…think of it as north south east and west..then when you water them put the water in the bucket. They continuously get compost tea. That way they don’t loose nutrients to too much water. Sounds amazing Jane! We make our own sauce too but don’t jar it. We use canned tomatoes – the squirrels gobble up all of our fresh tomatoes so we don’t stand a chance! Sounds divine! I’m definitely pinning this recipe. Hi how long do they last in the jars before they go off ? Chantelle, I make sure that I use the jars within a year. Hi can you also use this recipe with a pressure cooker? Oh yes, Leigh, you can use a pressure canner, but since I don’t have one, I cannot advise you on the amount of pressure or time that you would need to process the jars. And since you’re using a pressure canner, you can omit the lemon juice. Here is a wonderful link for info on pressure canning spaghetti sauce.